Wow. I have not written to you in a while. School work has been flooding my life, and I was in Boston last weekend to visit Boston College. I wish I could say that I've enjoyed my break away from the blog, but I really and truly missed it. I was itching to bake, and I did; however, it really wasn't the same not sharing the experience. Even if I don't always receive comments on what I write, I do know that someone, somewhere is reading, and hopefully enjoying, what I have created through my words and through my photographs. This blog provides me with an outlet for my baking and also with critics, as we learn through criticism. Boston was a beautiful city, but it didn't have the same energy that New York and Chicago have. The thing that I found most shocking was the lack of restaurants and bakeries. Even Charleston, small as it may be, has little niches tucked away on nearly every street. I didn't have a single phenomenal meal in the time I spent there, so I'm even more excited for my trip to New York this weekend (weather permitting) because I know that New York is chock full of incredible food. Despite the lack of tasty eateries in Boston, I was quite inspired by the gorgeous architecture. The light snow that sprinkled down in little crystals was so lovely that I simply had to recreate the experience at home. As Charleston is still only fifty degrees on the coldest of days, I turned to dessert to stand in for the flurry of snow. I was reluctant to try this at first. It looked like the beautiful, pillowy snow that I had been hoping for, but what would it taste like? The nougat candy that I had made earlier was interesting but nothing that I would eat on a daily basis. I could not have been more pleasantly surprised. The orange flower water gave it an intriguing aftertaste, and the texture was sheer bliss. 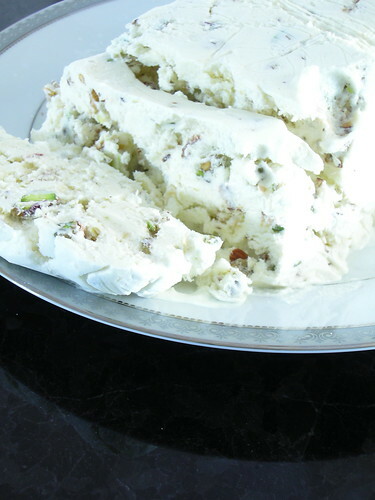 The crunchy praline was a wonderful contrast to the soft pistachios and the even softer nougat. In short, it was marvelous. Lightly oil a baking sheet. In a heavy pan, spread the 1/3 cup sugar in an even layer. Cook over medium heat until the sugar melts and begins to darken at the edges. Stir with a wooden spoon to ensure the sugar liquefies evenly. Cook sugar until it caramelizes to a medium amber color. 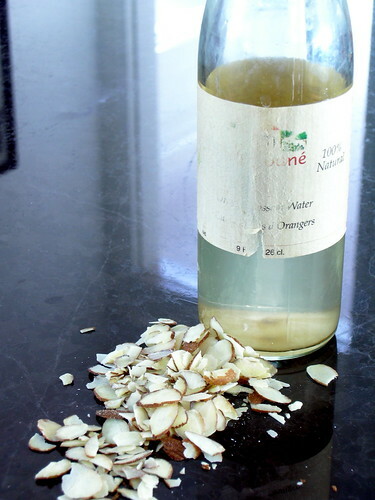 Remove from heat and stir in the slice almonds. Spread almonds and caramel onto oiled baking sheet and cool. 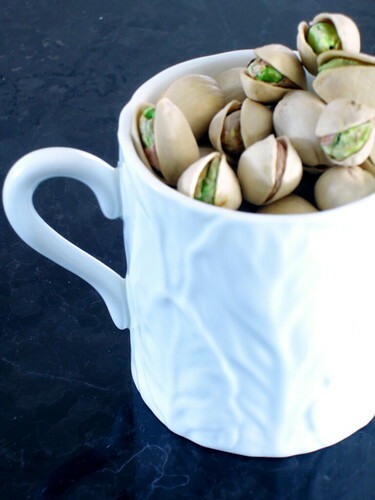 Chop into small, irregular pieces. Line a 2-quart loaf pan with plastic wrap and refrigerate. Heat honey and sugar in a small saucepan fitted with a thermometer. When the syrup reaches 200, beat egg whites and pinch of salt with an electric mixer. When the whites form soft peaks and syrup reaches 250 degrees, pour the syrup in a steady stream into the whites while continuing to beat. Continue to beat until the meringue cools to room temperature. Whip the cream in a separate bowl until it is mounding but still soft. 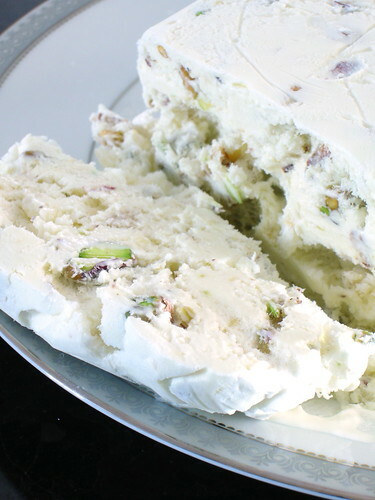 Fold the whipped cream into the nougat base, along with the orange flour water, pistachios, and chopped praline. Transfer nought to prepared loaf pan. Cover tightly with plastic wrap and freeze for 8 hours, until firm. Unmold the nougat, peel off the plastic, and serve on a plate. the red wine shorbert looks great. not sure how i missed that posting. regarding rest in new york. i recommend ouest and mama rosas. This dessert looks so good, and I hope that you have a wonderful time in New York. Please say hi to any cast members of GG for me if you see them!! I am following your blog from Germany and I have to say that I love it. I have tried a few of your posted recipes and I loved them. I am always looking for an update on your blog.